I don't know about you, but my kids have tons of stuffed animals, And, they never can seem to find somewhere to put them. They look cute on their beds,but when it's time to go to bed, they go straight on the floor at my house. Having a storage option is GREAT! Kids can now stuff their stuffed animals into the Sit 'n Stuff and also use it as a place to sit while playing games or watching movies. Having extra seating is a plus in my house. The Stuff 'n Sit by Creative QT has transformed stuffed animal storage! 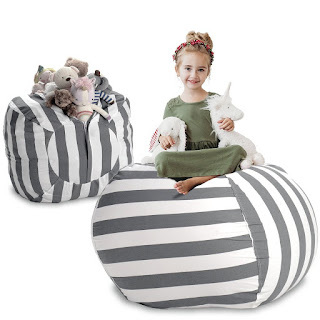 Families can take control of kids' stuffed animal collections by wrapping up to 90 toys in one comfy pouf ottoman and instantly clean up the room. Each ottoman is designed with strong, soft cotton fabric and an extra-long reinforced zipper, and comes in a variety of fun colors and prints, like blue polka dot, gray and yellow floral, and green stripe. The Original Stuff ‘n Sit holds 50 toys, the Large 75 and the Extra Large holds up to 90. Your extra throw pillows, blankets, and favorite dress up costumes are all equally stuffable! Make clean-up fun and create an extra seat in the same process with the Stuff ‘n Sit!